Christine Kidd knows all about how to overcome a challenge. For many years, she’s dealt with significant health issues, but she continues to face these head-on. As part of her self-development, she’s taken various word processing, computing and administration courses over the years, and is now a proficient audio typist who works from home. Christine wanted to further enhance her business skills and broaden the scope of the work she could undertake. She searched online, found The Career Academy and thought that our Certificate in Medical Reception looked ideal. This was confirmed by a phone call to Amy in our student support team who went through the course contents and also ensured that Christine was comfortable with the payment terms. Christine was on her way! 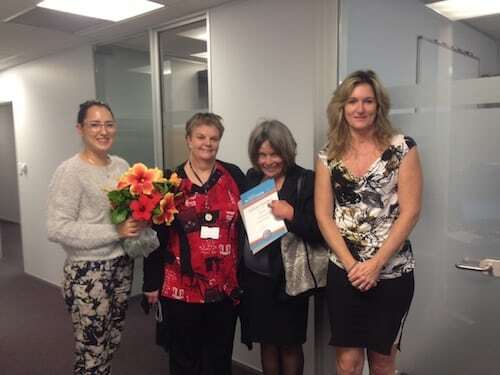 Pictured L-R: Amy, student support; Helen, Christine’s mentor; Christine Kidd and Tracey, tutor. One of the elements that Christine particularly enjoyed was taking a load of facts or statistics, interpreting that information and then formatting it into an attractive, easy-to-understand presentation. There was a moment of panic for Christine every time she e-mailed through an assignment for marking. However, as she continued to receive the most positive feedback (for example: “You have shown very good ability with this assessment and answered the questions in great detail. You have a strong business and personal ethic and it shows in your answers“) her confidence soared. The Career Academy are delighted that Christine has decided to carry on learning with us, this time with a more advanced course, the Diploma in Accounting. We wish her continued success.